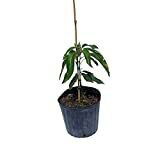 Mango tree growing tree of the genus Mangifera also known as Mango, Mango tree perennial evergreen plant also used as shade tree, can grow in tropic subtropical or mediterranean climate and growing in hardiness zone 10+. Leaves color is green in oval shape with pointed edge of the plants sometime can give the fragrant of the fruits. Flower color white green, the flowers 1 mm and grow in inflorescence. Fruit can be in a variety of sizes and shapes: fruit size ranges from 5-15+ cm, shapes ca be: elongated shapes, oval, round, flat, S-shaped. Fruit colors can be: green, red, orange. Sometimes Mango tree can be fibrous it’s recommend to buy varieties that are not with fibers (fibers it’s when in the Mango fruit has sting inside). 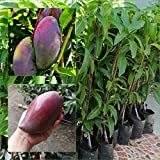 1 GRAFTED Mango Tree plant Nam-Dok-Mai Si Mueng 18" Tall Thai Purple Mango Fruit Juicy Direct from Thailand Free Phytosanitary Cert. What can be done with big quantities of Mango tree fruits?